Bearded Dragon Runs for Science! A brief post to show our progress in the BFF Locomotion Lab. We’re learning our equipment and training our lizards to walk and run. The lizards are rewarded with a cricket as a treat. 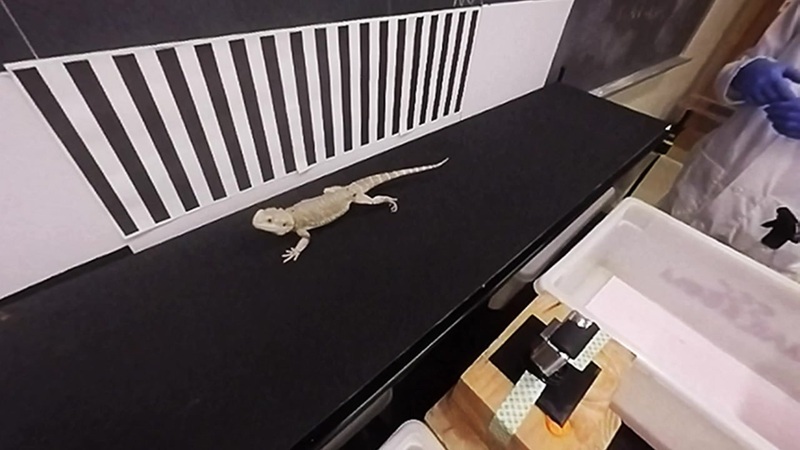 The lizard you see in the video is Graybeard, a juvenile bearded dragon (Pogona vitticeps). This video is comprised of two synched cameras and is a test video and not yet the “real” thing. But we’ll be capturing real data and more soon enough. As always, stayed tuned and there will be more reptiles running in the near future! This has been an exciting week for my students and I in the BFF locomotion lab. We have finally worked out multiple bugs in our system and have a bunch of very peppy and cooperative bearded dragon (Pogona vitticeps) lizards. Corey Barnes, one of the BFF undergraduate seniors and PreVet Biology major, captured one of our trials on a young beardie we affectionately named Greenbeard. As you can see in the video below, we entice the lizards to walk and run by tempting them with their favorite treats – crickets! Although the lizards cannot get the treats immediately (we need the incentive), they each get a tasty cricket after each trial to reward them for a job well done. Yes — these are juveniles … adult bearded dragons will be filmed as well. The data we are collecting will form the basis of a comparative study of the relative movements of lizard forearms relative to the body across several species. Given that the earliest mammals and dinosaurs had a forelimb posture not unlike lizards (in some respects, lizards have “held on to” the ancestral forelimb posture and anatomy of early reptiles and mammals), they are acting as a model to test hypotheses about the transition from sprawling to upright forelimb postures. The treadmill was custom made for us by JogADog, and we’re capturing data from reflective markers using the OptiTrack V120 Trio system for motion capture. 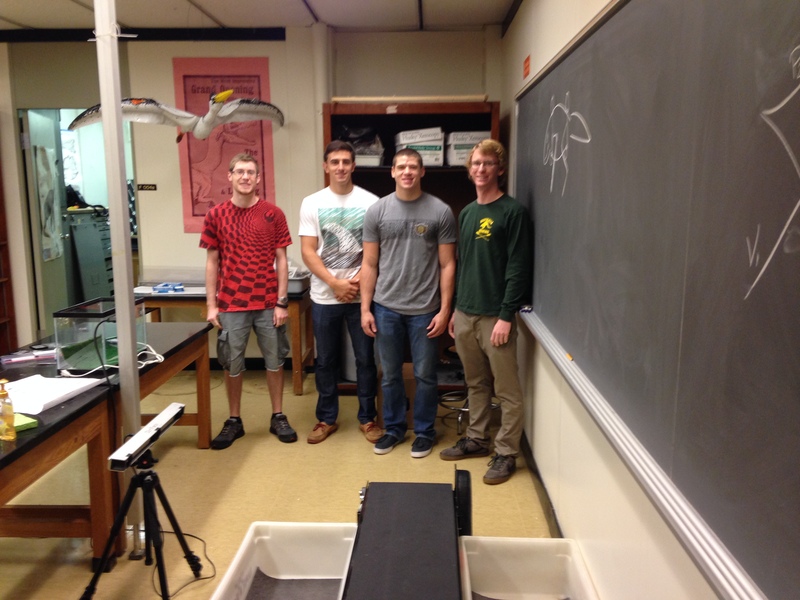 The “Bonnan Beardies” crew with our treadmill (center) and motion capture system (left). From left to right, Alex Lauffer, Kieran Tracey, Alex Hilbmann, and Corey Barnes.